Australian Production House Full Throttle Entertainment (FTE) wouldn’t exist today if it wasn’t for the entertainment mecca in the desert called Las Vegas. 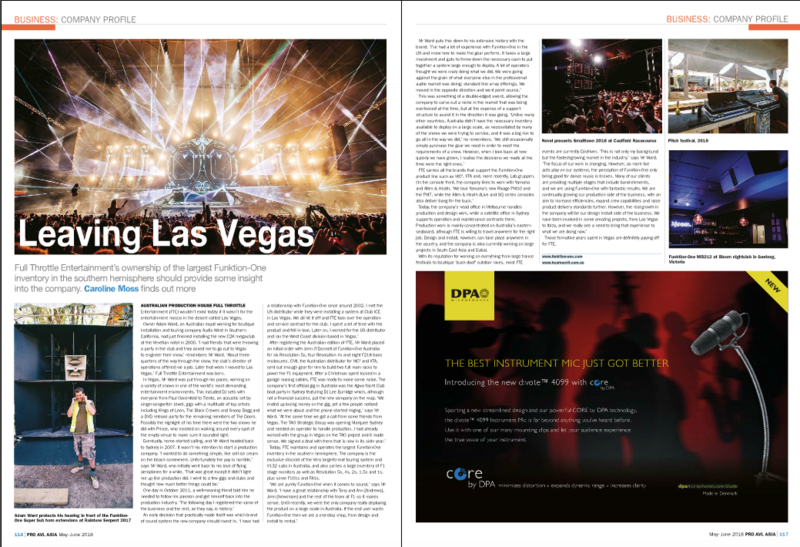 Owner Adam ward, an Australian expat working for boutique installation and touring company Audio West in Southern California, had just finished installing the new C2K mega-club at the Venetian hotel in 2000. ‘I had friends that were throwing a party in the club and asked me to go out to Vegas to engineer their show,’ remembers Mr Ward. ‘About three-quarters of the way through the show, the club’s director of operations offered me a job. Later that week I moved to Las Vegas.’ Full Throttle Entertainment was born. Read the full article in the May/June 2018 issue of Pro AVL Asia.